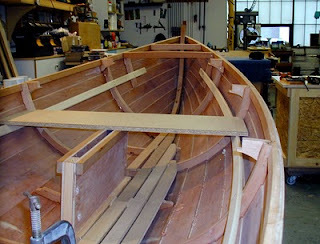 With the boat framed up and the sail plan finalized, it is time to nail down the interior layout. There are two givens; the forward and the aft rowing thwart positions, which I laid out to plan. Starting with these two thwarts, I drew up the deck plan and furniture arrangement. Deck plan and interior arrangement. I've always known I would deck the boat. Washboards (side decks) and coamings do a wonderful job of keeping the water out, and will allow us to sail the boat a little harder than we might with open gunwales. On the other hand, a large deck area can choke up the interior, particularly if side benches are to be fitted, as I am doing here. I had initially intended to step the main mast through the deck, but after thinking about this, I decided to keep the end decks short, and step the main mast through a thwart. This would allow me to fit a mast gate so that I might more easily step or ship the mast afloat. 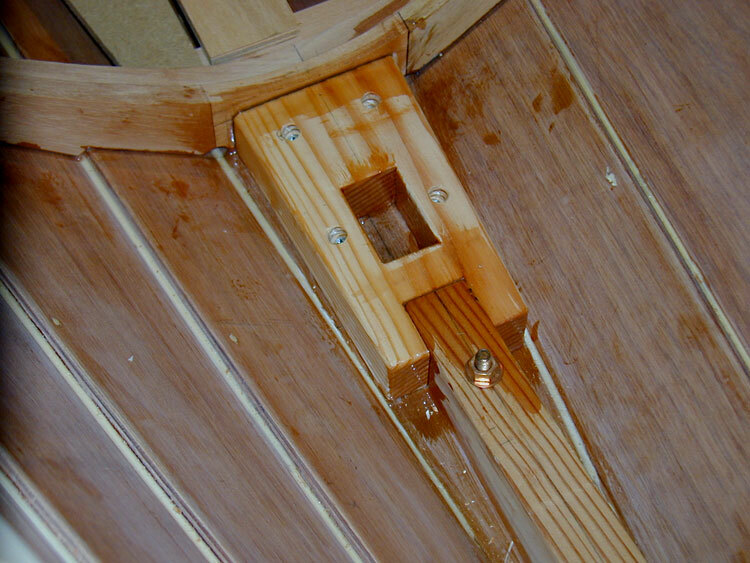 The heel of the mast is set into the step mortise, and the mast is pushed upright through the open gate. 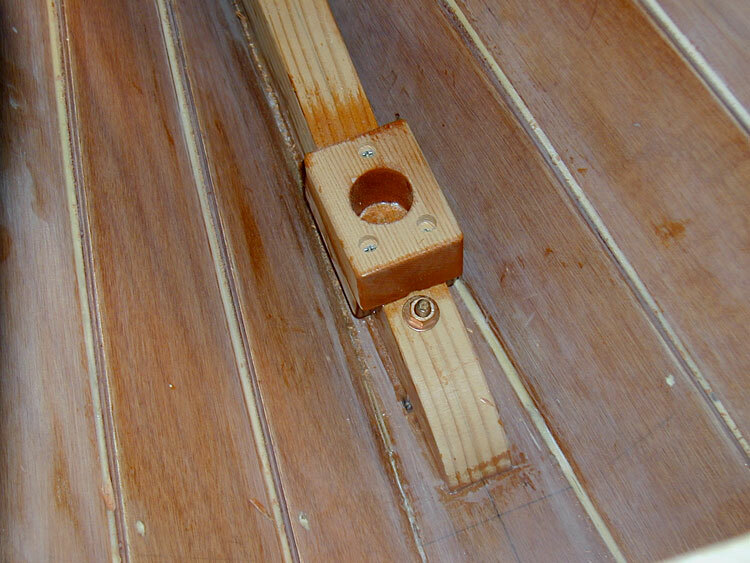 Once in position, a heavy pin will be slid into place behind the mast, closing the gate. This is all quite a bit easier than standing up with a mast held high, and trying to get it down through a hole in the deck and into the mortise in the step, with the boat rolling and pitching to boot. The substantial lever of a flailing mast can tear up the whole front end of the boat! So I laid out the deck to stop just short of the mast forward. The mizzen, being a much smaller and lighter stick, will pass through the aft deck. I cut the main mast step from more of my dumpster fir, notching it around the stem knee and butting up tight against the forward frame. The mizzen step sits right on top of the aft stem. I glued and screwed the steps down with epoxy and bronze screws. ...while the mizzen step sits on top. Next, I got set up to fit the seat risers. At the forward thwart location, I leveled across to the side of the boat from the dagger trunk (I double-checked that the boat itself was still level athwartship). I tacked battens in the boat port and starboard, temporarily nailing these into the frames when they were pulled up level. To make this easier to do, I cut out temporary flake board thwarts, resting each end on the riser battens with a spirit level on top (I'll use these later to make patterns for the real thwarts). At the aft rowing thwart, I nailed the battens in a set distance below the sheer (at proper rowing height), again leveling across the boat. I then hauled the battens into place at both ends of the boat, pulling the forward end as high as I could to maximize the bury of the mast (the mast partner rests on the risers). This all took quite a bit of fiddling to get right. There is a lot of twist in the riser, and the battens don't want to lay flat on the frames, compounding the difficulty of accurately determining the correct height. 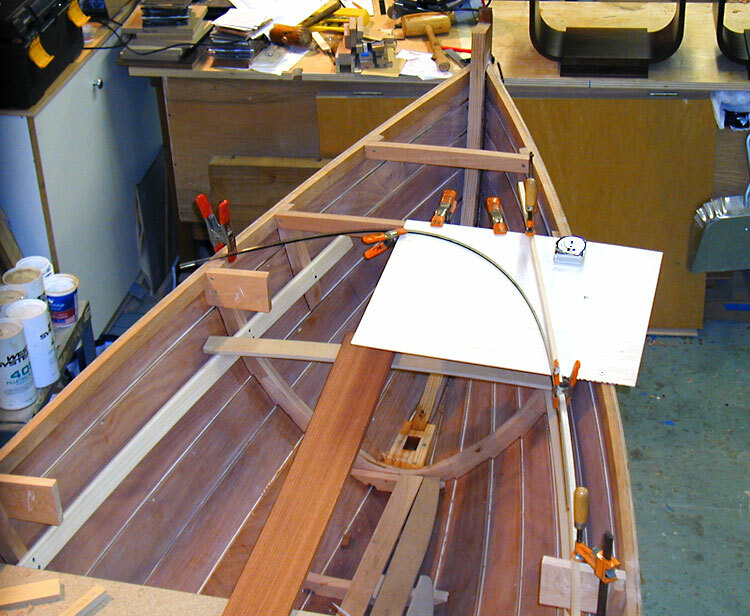 I was afraid the risers themselves would be hard to bend into the boat, but they were relatively easy to get in, and I clamped, then screwed them without glue to the frames at the correct height. They will be removed again to paint the interior, then re-hung with glue later. Finally, I fitted the aft most thwart pattern, set just forward of the end deck, and some rough approximations of the side benches. The 'midship side benches are quite long, so I fitted a knee in the middle of their span, to help support them. 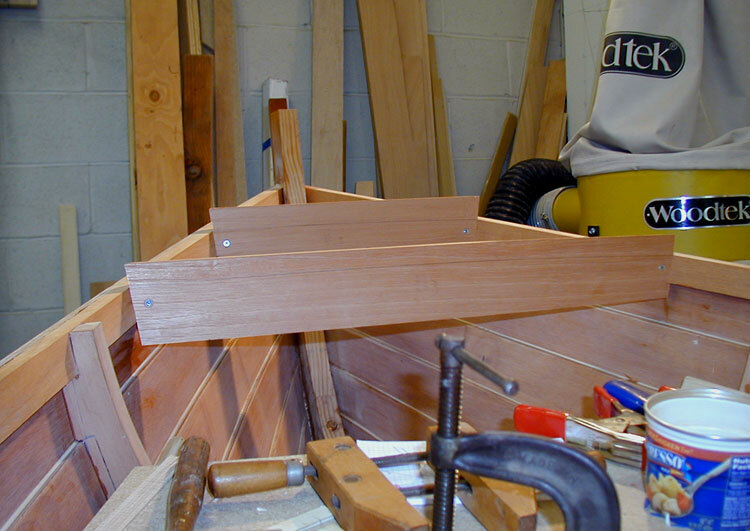 With these all in place, I was really able to get a feel for the interior structure of the boat, and I like it! There are plenty of seating options available to trim the boat, depending on crew. The push-pull tiller will have a screw-on extension for solo sailing, allowing me to move close to the middle of the boat. It can be removed for the skipper to slide aft when more crew come aboard. I have to say that I quite like this type of steering, having used it for years in my sailing canoes. The actual seat risers are fitted, and knees are added to support the side benches at mid-span. Close up view of the side bench knee and riser. Now, its on to the deck beams. Once the extent of the end decking was known, I installed the full length beams in the end of the boat. I glued little short blocks to the inwale, to which I would glue and screw these frames. The frames could also be let into the inwales, but I chose not to do it that way. The compound bevels on the beam ends were cut quickly with a hand saw. I left the beams wide until they fit snugly, and were screwed in place. I then scribed them to the deck camber with a template, removed them and cut them to shape, and glued them back in permanently. Deck beams are fitted, then marked out to the camber and cut out. 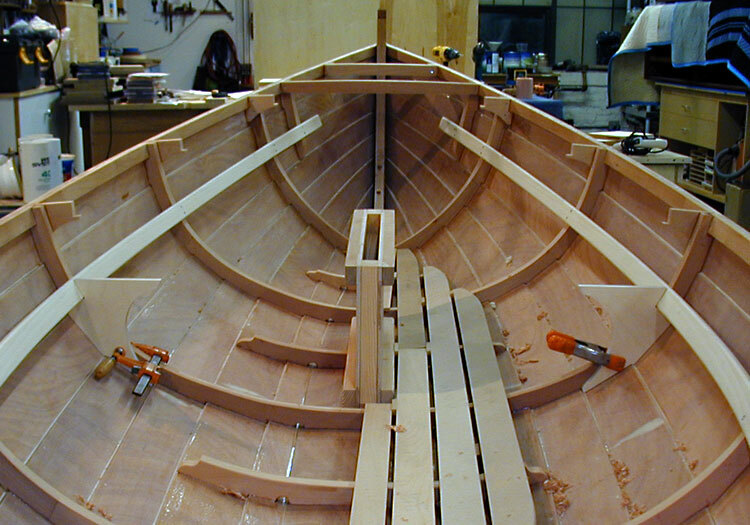 The little short washboard beams, or knees if you prefer, were a little trickier to fit, notching over the inwale and extending down along the inside of the sheer plank a couple of inches. This shape gives them enough strength, when glued and screwed to the frames, to stand alone without angle braces of any sort. Like the full length beams, I left them over size and temporarily screwed them all to the boat. To determine their exact length, I sprung in a batten from end to end, terminating at the full length end deck beams. At the same time, I put in thin ply template stock at each end, and bent a drafting spline to the shape of the oval deck ends, fairing this into the batten. This gave me the exact shape of the complete deck. 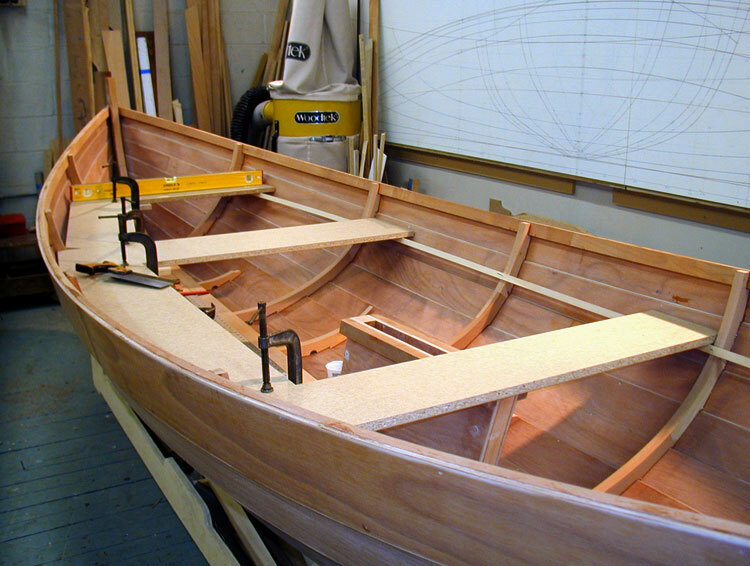 Carlin batten and oval coaming template. I marked all of the knees, then removed them and laid out their shapes. There is a longitudinal timber called a carlin, which defines the outer cockpit edge and supports the decking, much like the inwale does out at the sheer. I like to rest the carlin in a notch cut into the knees. 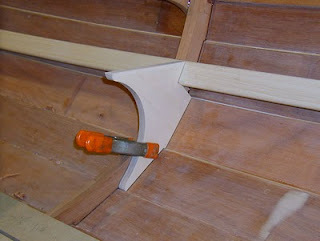 I cut this notch in each knee, using the layout line that I marked from the batten. I then marked and cut a curve in the underside of each knee. 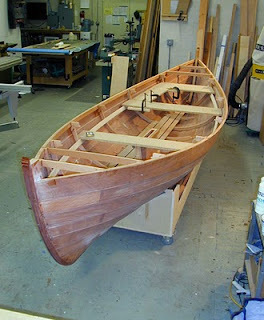 When the knees were all cut, I glued and screwed them into the boat. The deck knees are all glued in. Knees are notched for the carlins. Before going any further, I need to stop and paint the interior. Any other structure in the boat will make it too hard to paint around. The carlins in particular would be in the way, and I'll also wait on the oval deck framing and the king planks for the same reason. I can't wait to paint the inside! Should make a great little camper/cruiser. Some planks laid on top the seat thwarts and you have a nice spacious sleeping platform. Boom tent strung between the masts and you're cookin' with gas. Good thinking on stepping the main mast, too. I did consider rigging this boat for camp cruising, by installing side bench tanks, an offset dagger board, and a raised sole, much like the layout in John Welsford's Walkabout design. But I opted for the more trad layout. You're right though. It would be easy to carry a folding bunk flat to convert the seats for sleeping, with the gear stowed below. looking good. 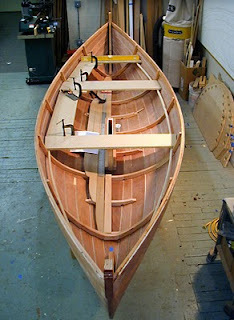 I cant wait to see it on the water with crew to get a sense of the scale and interior space.